← IPCC – Intergovernmental Panel on Crack Cocaine? But NASA has conspired with advocates of the man-made global warming cult to ‘hide the decline’ which would make a mockery of their trumped claims mankind has created a new and warmer Anthropocene Climatic period. Our nameless expert explains that since the 1990’s and into the 21st century magnetic fields have dropped by about 50 gauss per year. No one denies that in itself, this is not a remarkable drop if it were to be soon reversed. However, if such a trend continues for a decade or more then the fears of solar scientists that we are entering a new Ice Age will be realized with potentially devastating consequences for life of Earth. The unidentified insider explains that one of the doomsayers guilty of propping up the false global warming story and who has now been forced into an embarrassing recant is NASA’s solar physicist, David Hathaway. Hathaway had claimed that Solar Cycle 24 would be strong but it wasn’t. But like many scientists wedded to the doomsaying cult it was not until recently that Hathaway felt forced to drop the bar and suggest that Solar Cycle 24 may be weak and not the 50 percent stronger he had suggested in 2006. With no rises in global temperatures since 1998 and global cooling this century, the wider scientific community is discovering that a clique of self-serving climatologists have deliberately misinterpreted data from the Sun’s Great Conveyor Belt. Sadly, revisionists within the Intergovernmental Panel on Climate Change (IPCC) have succeeded for two decades in re-writing the Earth’s temperature records. They have also succeeded in obscuring the proven key role the Sun plays, as witnessed by Judithgate whereby the 2007 IPCC Report relies on the work of ONE biased solar scientist, Judith Lean who positively ‘reviewed’ her own work. Both of these blank periods have occurred in the current solar cycle and both were only days away from taking third place in all time spotless sun days since modern records began back in 1850. 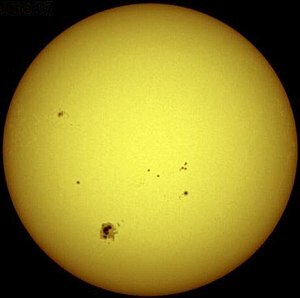 They were conveniently ‘stopped’ by counting areas that prior to the 21st century would have not been counted as true sunspots – a clear case of cherry-picking.